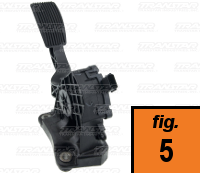 In 2003, Ford introduced the 5R110W transmission for use in heavy duty applications. Its primary purpose was to replace the four-speed 4R100 units. The 5R110W, or TorqShift five-speed unit, features a Tow/Haul setting to help improve hauling performance as well as preserve the life of the transmission and improve the safety and drivability of the vehicle. Hunting back and forth for the right gear under load has killed many transmissions, and it is certain death for this unit as well. Throughout the next decade, Ford made significant changes to this much abused unit: Three generations of oil pump assemblies and multiple changes to the planetary systems and drive shells, both of which were in response to durability needs. And along the way, this unit has killed perfectly good torque converters. We are going to review torque converter symptoms and their causes starting with what can first be addressed while the unit is still in the vehicle. Then we will move on to things that must be addressed by removing the unit and tearing it down for corrections. 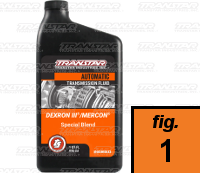 A common mistake that can have severe consequences is to fill the transmission unit with fluid but forget to put fluid in the torque converter prior to installation. Failure to follow fluid-filling procedures with the 5R110W unit creates a situation with no forward and/or no reverse. If this happens, you have most likely killed your oil-pump assembly. In most cases, this means that you have broken pump gears due to a lack of fluid. Make sure to add fluid to the torque converter prior to stabbing it into the transmission unit. Then add 8 quarts of fluid to the unit, run it for 30 seconds, then shut the engine off. Add 4 more quarts of fluid to the transmission, then restart the engine. Complete filling the transmission to the correct level as recommended by Ford. Save your pump and save your torque converter (Figure 1). You can also get TCC cycling on and off by having mismatched tire sizes or mismatched levels of inflation. 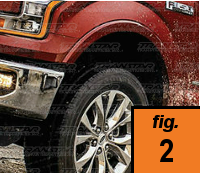 Specifically in four-wheel-drive units with the BorgWarner 44-05, mismatched tire sizes or mismatched inflation will cause engine surges that seem like TCC cycling (Figure 2). The symptom of harsh TCC apply can be caused by two different types of issues with externally accessed items. The first issue is that the air filter can be restricted or dirty. Much like the mismatched tires, this can cause engine surges or simply an engine that runs poorly. This can cause lockup to be dramatic. 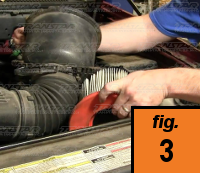 This can be easily addressed by cleaning or replacing the engine air filter (Figure 3). 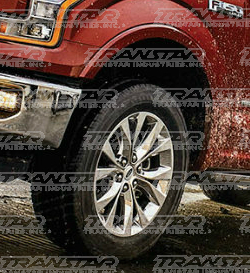 The second area causing harsh TCC apply is issues with the four different vehicle sensors. 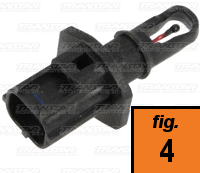 Related to the air filter, the Intake Air Temperature Sensor (Figure 4) can be dirty or it can be malfunctioning. Replace this sensor if it is found to be dirty or faulty. The next sensor to check is the Accelerator Pedal Pressure Sensor (APPS) (Figure 5). This can also get dirty or malfunction. 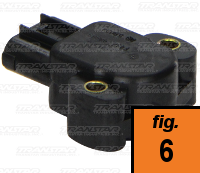 The Throttle Position Sensor (TPS) (Figure 6) must also be checked. 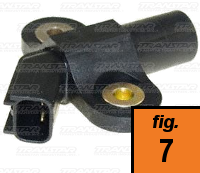 Finally, check the Manifold Absolute Pressure Sensor (MAPS) (Figure 7) and replace as necessary. All of these sensors affect the way the engine functions, and if they operate poorly they will make it seem like the torque converter has apply issues. Another malfunctioning sensor can cause the symptom of no lockup, as well as set the codes P1704 and P1744. This sensor is the Range Sensor (MLPS) (Figure 8). This can become dirty or malfunction and cause functional issues as well as set codes. Inspect and replace this sensor if necessary. As you run down the items from outside the case to inside the case, don’t forget to check this one. A final pre-emptive move to make is to check the grounding on your unit. The 5R110W is creating some legendary stories of bad symptoms related to poor grounding. 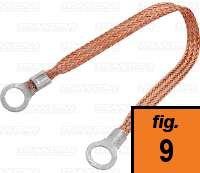 Oftentimes, rebuilders are adding a ground strap to the transmission itself thinking this will cure the issue. Soon, there is a no-forward or reverse problem. Surely it must be the torque converter. What has happened is that the bad ground has caused the pump gears to overheat and break, or appear to be welded to the pump assembly. 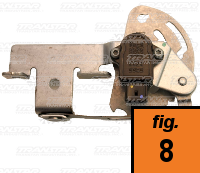 The fix is outside, but do not attach the ground strap to the transmission. (Figure 9). Vehicles used to pull or haul loads almost always have overheating issues. 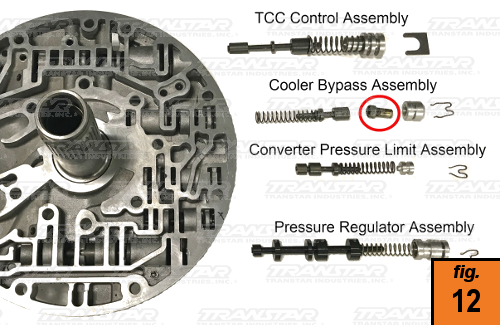 Hot transmissions cause early failure of the torque converter and other components. The 5R110W unit is no exception. There are three problem areas to check. The first would be to eliminate the direct cause of overheating. That could be as simple as making sure the lines are properly flushed to ensure that there is no restriction of cooler flow. It could also be making sure to install an additional aftermarket transmission oil cooler. The second is to check on the bypass filter. This filter functions similarly to the traditional aftermarket bypass filter installed after a unit is rebuilt to help collect any leftover metal missed in flushing and installation. This OEM designed filter, however, is to provide an additional superfine filtration process to normal transmission function. 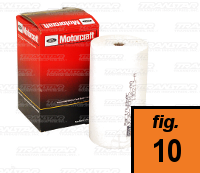 For the years 2003 to 2007, the filter is a toilet paper roll type (Figure 10). 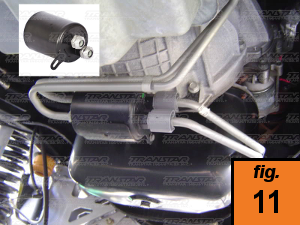 From late 2007 to 2010 it is a sealed metal canister that installs directly to the transmission case or to the vehicle underbody (Figure 11). In 2011, Ford shifted this filtration function to inside the case. Regardless of model year, this filter must be changed to avoid killing your recently rebuilt unit. The final item is the PCM. The 5R110W does not have a traditional valve body, but the PCM is still the brains of the outfit. When this computer module gets dirty or fails, there is a long list of symptoms. However, it can also cause overheating which can cause torque converter malfunction. Much like the 4R100 transmission, the 5R110W has a complex oil pump assembly with multiple valves that control pressure and torque converter function. Any number of converter symptoms can be drilled back down to issues related to valve wear. 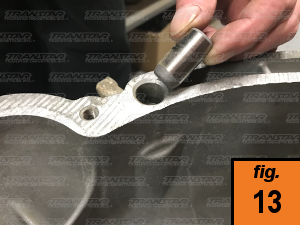 The TCC Control Valve section can have problems due to wear, as well as due to mistakes made when rebuilding the TCC Control Valve Assembly (Figure 12). A worn TCC Control Valve circuit will cause lockup slipping, cycling, as well as lockup related codes 741 and 1783. All components in this circuit should be replaced as a full assembly. However, there are three different versions of this valve. The 2003-04 models have a valve that has a spool outer diameter of 0.402 inches and is 3.570 inches long. The 2005 and up valve is almost a quarter inch longer at 3.770 inches long. The early version of this valve is not available new, and cannot be used in 2005 and up pump assemblies. Both the 2005-08 and the 2009-up pump assemblies retrofit to the earliest application. However, do not reuse this early type valve. It will cause torque converter lockup failure. When installing the retaining clip for the correct diameter and length TCC Control Valve, make sure that the sleeve feed hole is visible. If assembled incorrectly, the code P1744 will show up during transmission operation. And nobody likes to drop a unit to fix a problem that can be avoided by getting it right the first time. The Converter Pressure Limit Assembly may be one assembly that can cause almost all of the torque converter malfunction symptoms in your customer’s 5R110W unit (Figure 12). The wear or failure in this assembly can cause TCC codes, lockup slipping, erratic or harsh lockup apply, leading to torque converter lining failure, as well as excessively high torque converter pressure. And that excess pressure can lead to clutch failure and torque converter ballooning. It is like the transmission engineer stepped back, looked at the unit, and decided to choose one circuit to ruin them all. The truth is, just like this one circuit can be completely to blame, it can just as quickly fix all of the issues, too. How many times have you blamed your torque converter supplier for lining failure in the 5R110W? The truth of the matter is that lining failure in this unit is rarely the fault of your rebuilder. Your pump assembly will be the problem the vast majority of the time. The Pressure Regulator Valve Assembly can also cause you lockup misery (Figure 12). When this section wears or malfunctions, you will get TCC apply and release problems. That can mean no lockup, or lockup won’t disengage, which can cause clutch lining failure. When installing a replacement assembly, make sure you install the valve clip correctly. Incorrect installation of this clip will set codes P0703, P0741, and P1741. One little clip can kill a whole day of hard work. A small item that can cause overheating is the thermal element found in the cooler bypass valve assembly (Figure 12, circled). The heating element pin should function when it reaches the correct temperature. If stuck shut or open, the transmission can function poorly in cold weather or overheat in hot weather. Make sure to heat the element to determine if it is functioning properly and replace when necessary to save your torque converter and transmission from failure. Finally, you will find in some cases that you have broken pump gears. And this is after you have rebuilt the unit. It makes you start to question the overall height of your torque converter, the unit end play, and whether you should have shimmed the flexplate. It must be the torque converter that broke your pump gears! An easy problem with this unit is that worn dowel pins can cause case misalignment. Make sure that you check dowel pins when reassembling this unit. If you do, you can save yourself money and time and avoid frustration. (Figure 13). Remember, when troubleshooting, start with the easy outside target areas before moving to the inside of the transmission. Plan out good detailed build practices and avoid the comebacks. Mike Cargill, a board member of the Torque Converter Rebuilders Association, is Senior Category Manager at Transtar Industries.